Rose Coschignano/Staff Photographer Tiffany Jones, three-time breast cancer survivor and founder of PinkChoseMe Foundation, talks about her experiences with the disease and the importance of getting preventative care during Binghamton University’s 9th annual Breast Cancer Festival. Students, faculty, community members and survivors gathered at Binghamton University to raise awareness for breast cancer on Sunday afternoon. Hosted by Powerful United Ladies Striving to Elevate (PULSE) and the Omega Phi Beta Sorority Incorporated chapter on campus, the 9th annual Breast Cancer Festival featured dancing, food and raffles, with each raffle ticket donating $2 to either the American Cancer Society or PinkChoseMe Foundation, a nonprofit organization that aims to support women who have been affected by breast cancer. In addition to fundraising for breast cancer organizations, the event also aimed to educate and raise awareness about the disease. According to Christine Cadet, community service events coordinator for PULSE and a junior majoring in psychology, events like the Breast Cancer Festival help uplift survivors and direct proceeds to critical research. 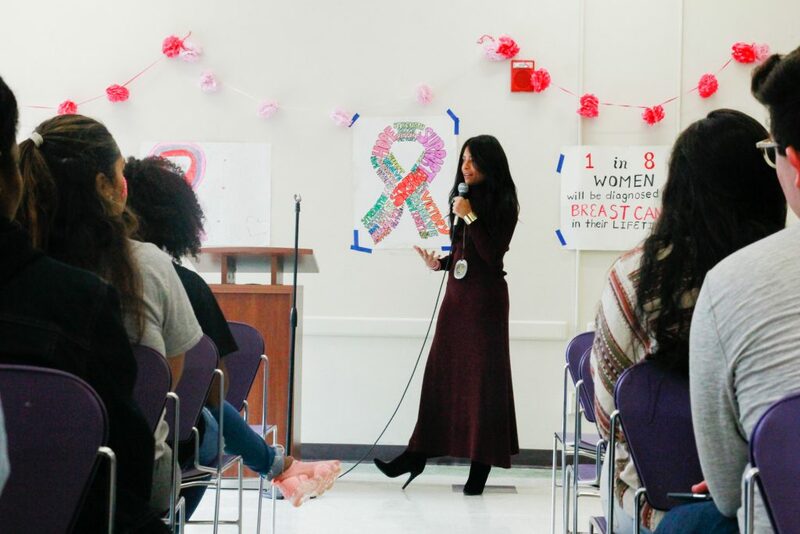 The event also included an address from Tiffany Jones, a three-time breast cancer survivor and founder of PinkChoseMe, who spoke on her experiences with the disease and the importance of getting preventative care. Approximately 25 percent of the proceeds raised at the festival will go to Jones’ organization, which aims to uplift survivors and those battling breast cancer. Several other student organizations also tabled at the event, including Omega Phi Beta and Women Empowered Support, Protect, Educate, Advocate and Know at Binghamton University (WESPEAK BU). Savannah Markel, president of Omega Phi Beta and a junior majoring in human development, said her sorority is heavily focused on leading philanthropy efforts for breast cancer. According to Markel, it’s important to shatter misconceptions about the disease. “A lot of people don’t know that if you’re younger, you can get diagnosed with breast cancer, [and] if you’re a man, you can get diagnosed with breast cancer,” Markel said. She added that the disease can impact people of different races and socioeconomic classes, a fact that is often overlooked. Kathleen Guerrero, a junior majoring in integrative neuroscience, attended the festival and said she learned more than she expected about the importance of personal and medical checkups. “I feel like since it’s breast cancer awareness month, it’s important to tell women and everyone in general to check up on their follow-ups and their medical visits because you could prevent stuff that could be deadly to you,” Guerrero said.